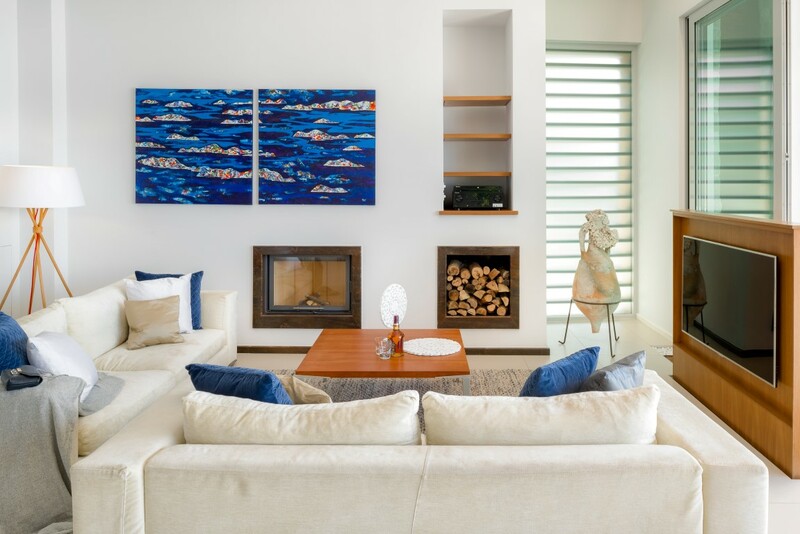 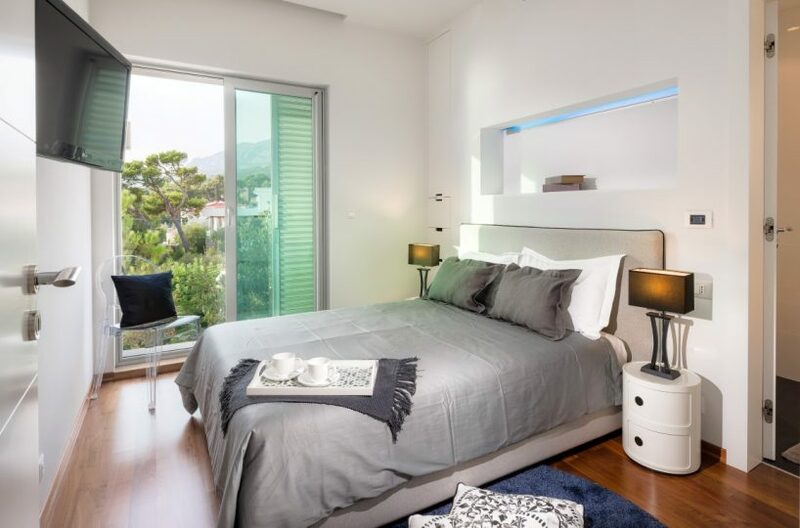 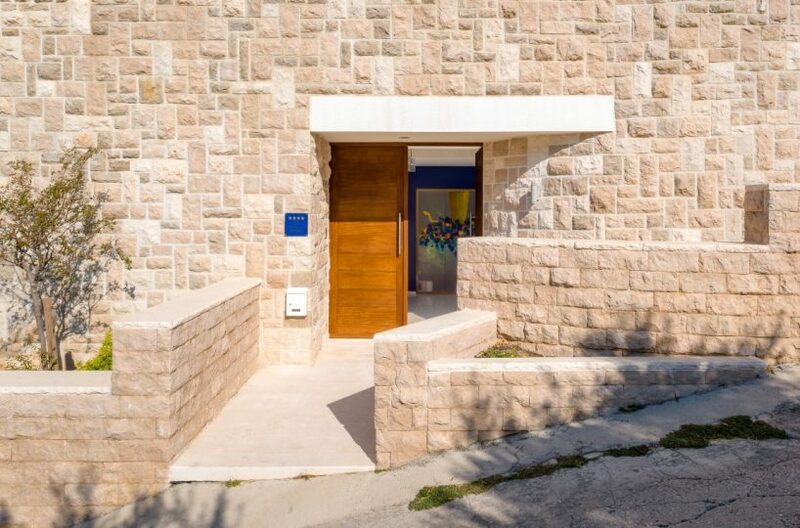 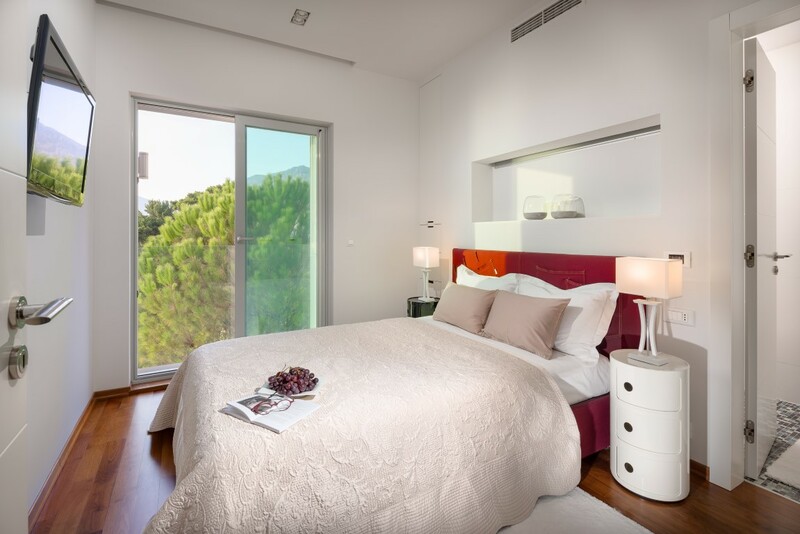 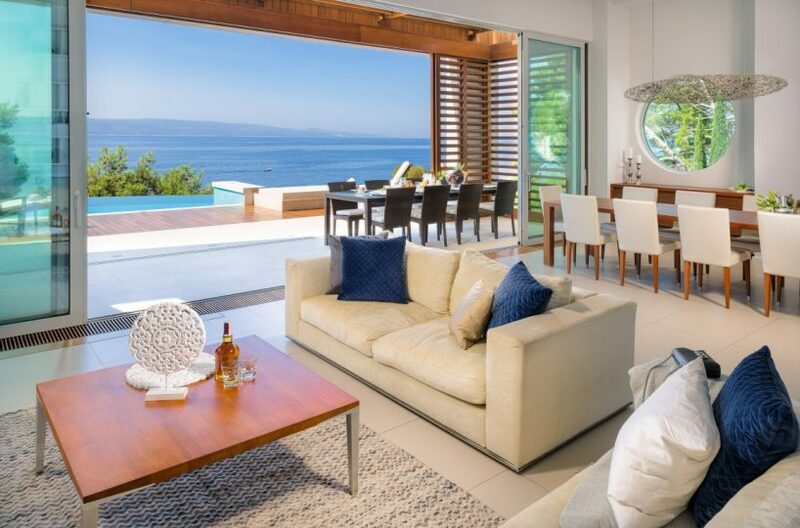 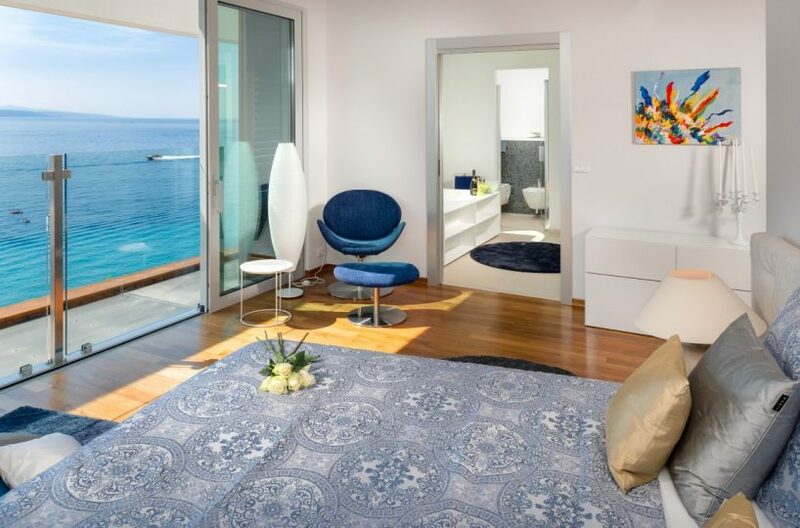 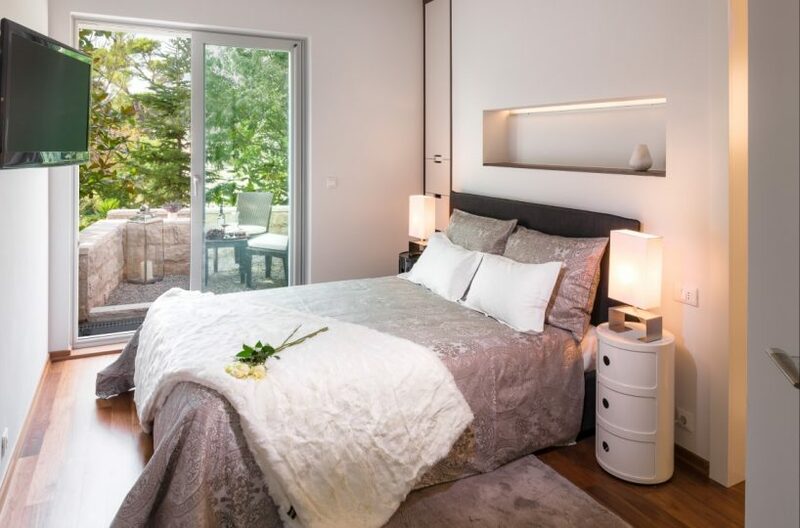 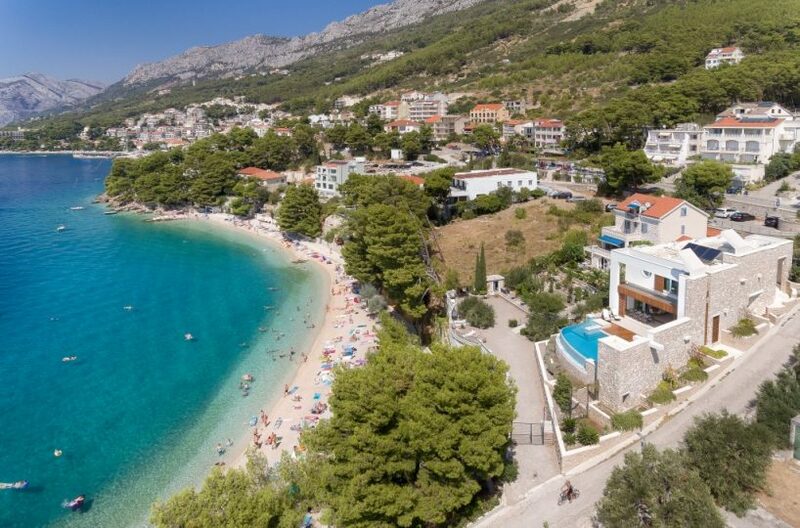 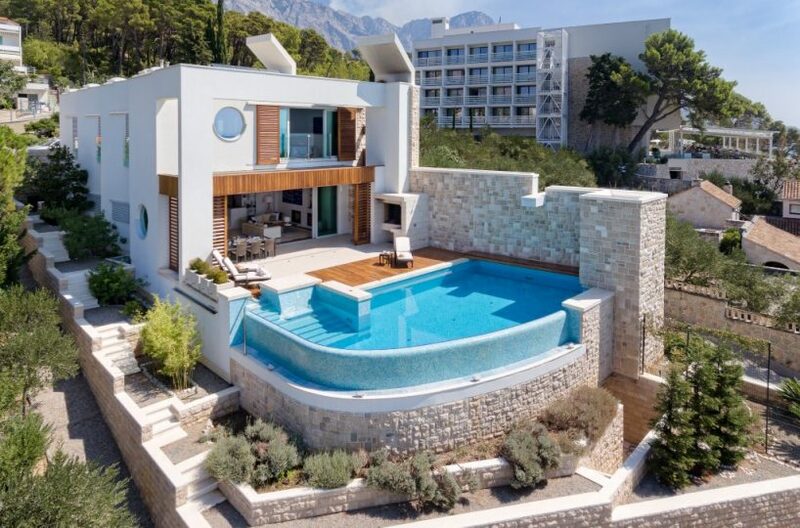 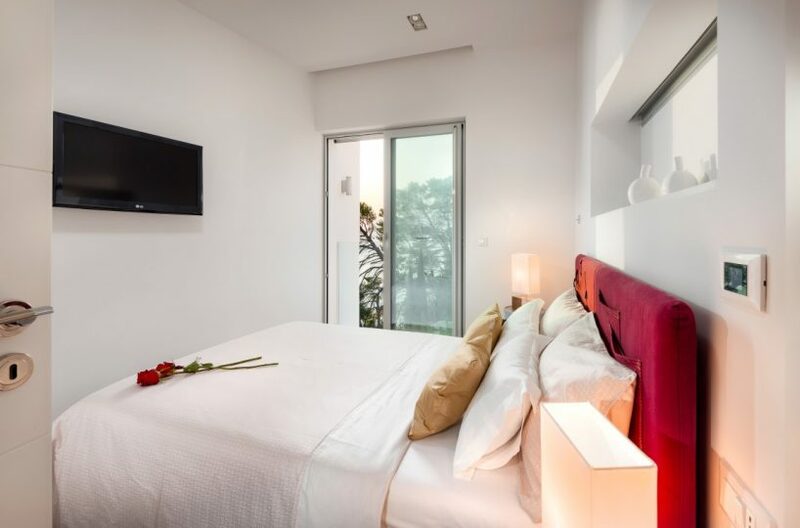 Sea view luxurious villa in Brela, Makarska is a brand new modern villa with stunning view over the peaceful and wonderful bay, south from Brela. 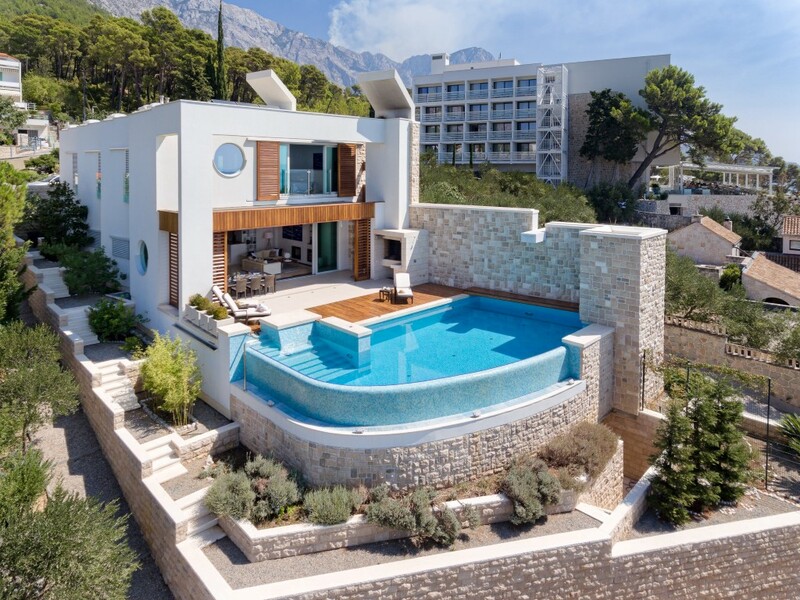 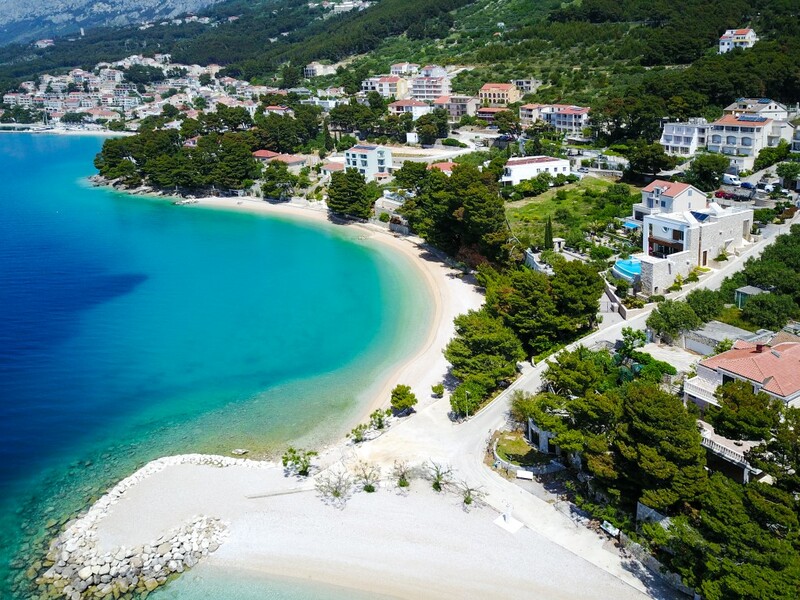 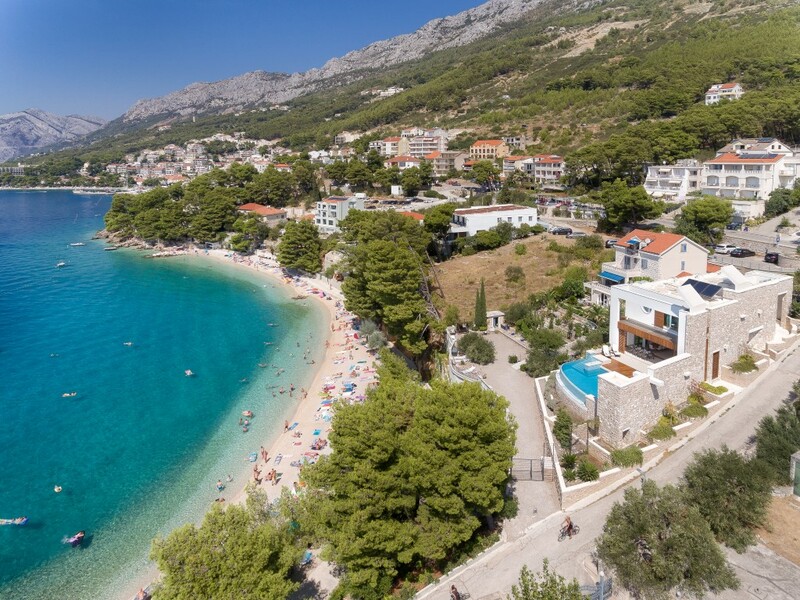 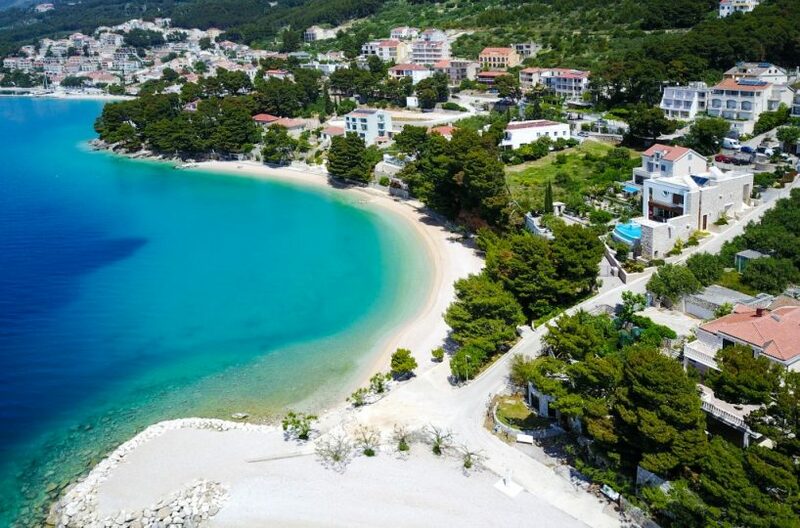 Villa is only 10 meters away from the beautiful pebble beach and crystal clear sea of Makarska Riviera which makes it the spot for luxury villa retreat in Croatia. 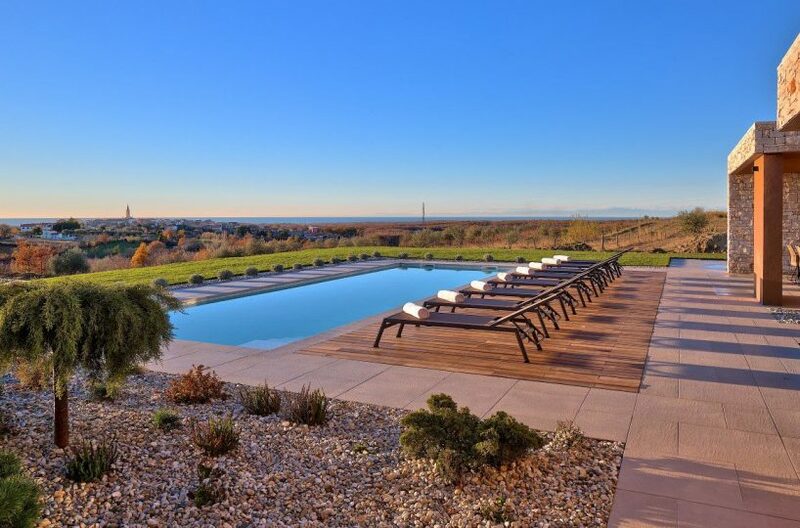 Villa Dalmatia Luxury is a private, stone villa with large, heated swimming pool, 5 en-suite bedrooms, gym, sun terrace with magical views and it is a perfect accommodation for 10+2 persons. 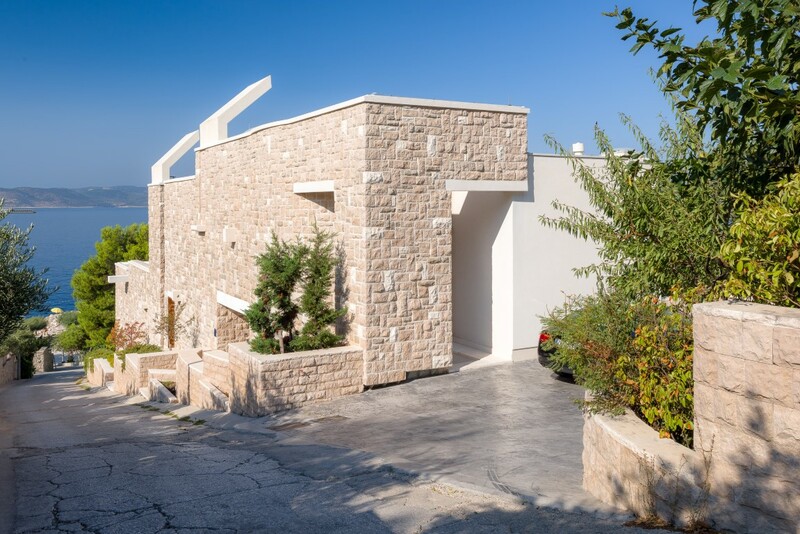 Villa is spread on three floors, basement, ground floor and first floor. 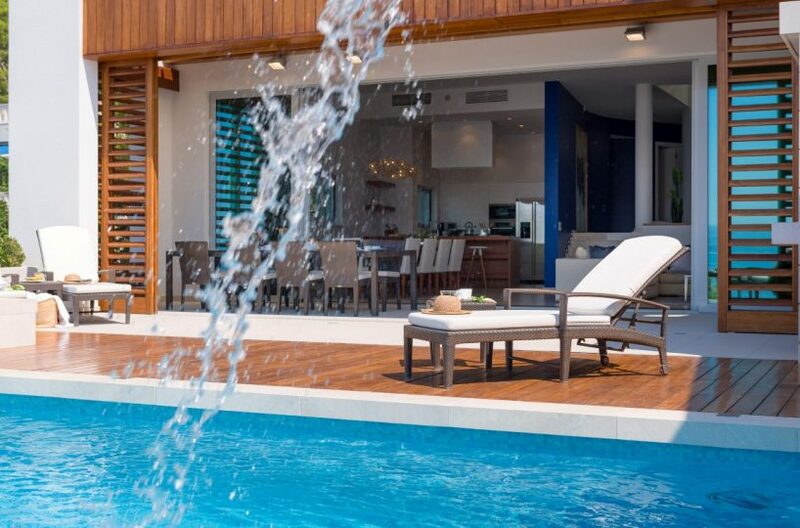 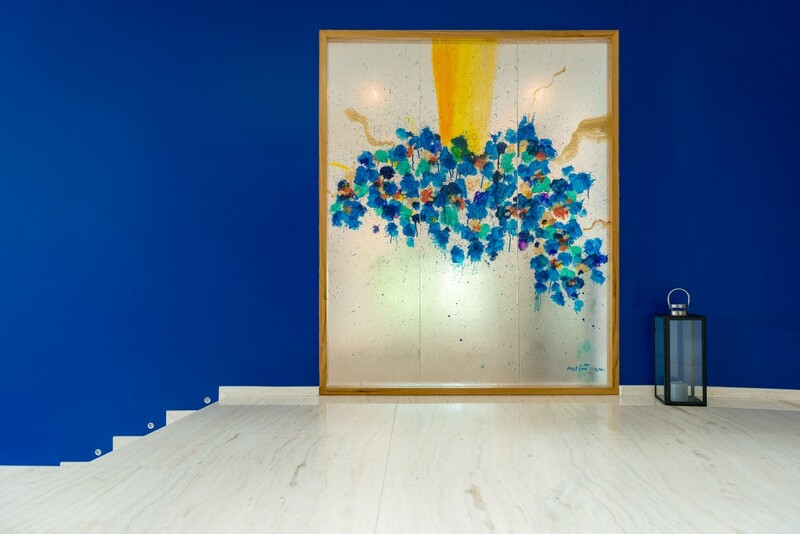 Upon entrance to the villa’s ground floor, there is a spacious and light living area connected to the pool terrace through the high glass sliding doors. 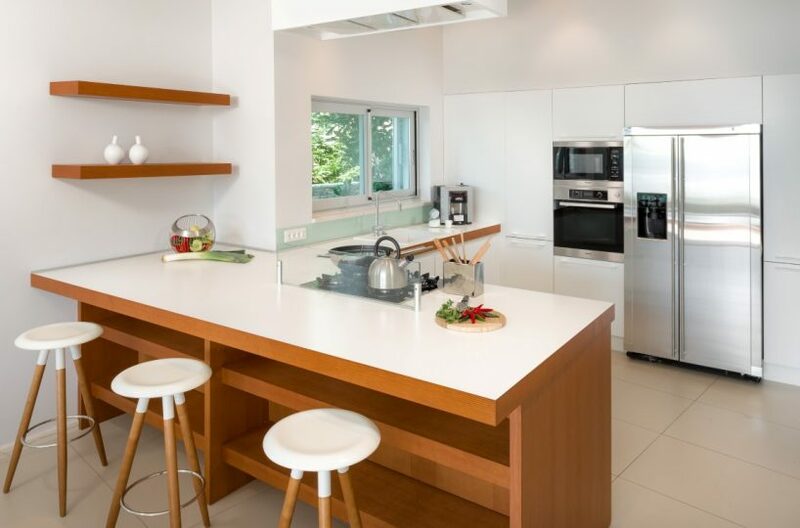 Living area comprises dinning room with table for 12 persons and a fully equipped modern kitchen (stove, dishwasher, microwave, kettle, toaster, coffee machine). 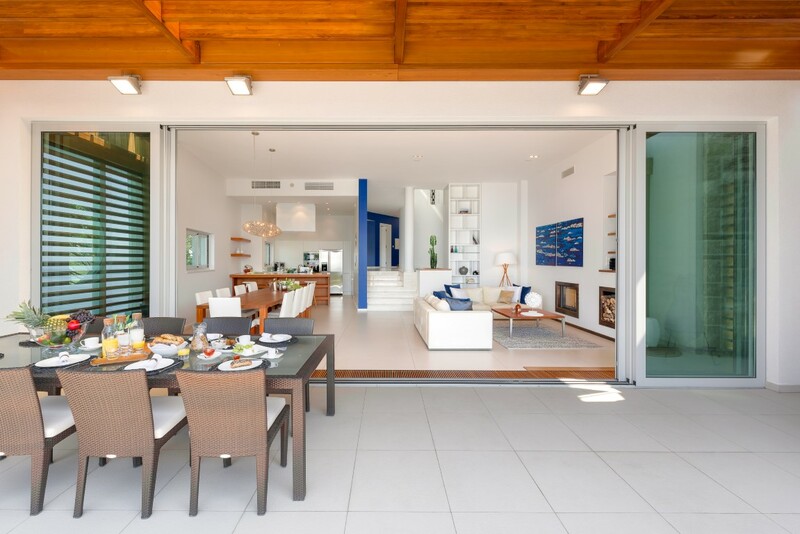 This part is full of natural light entering through the glass walls facing south. Terrace offers beautiful lounge area with sun beds by the pool, an outdoor dining table and grill, perfect for enjoying an al fresco dining in the hot summer days and evenings. 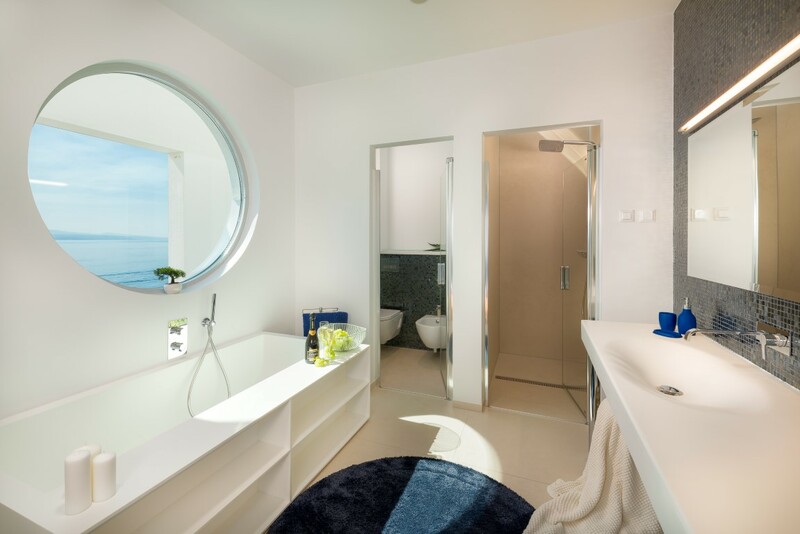 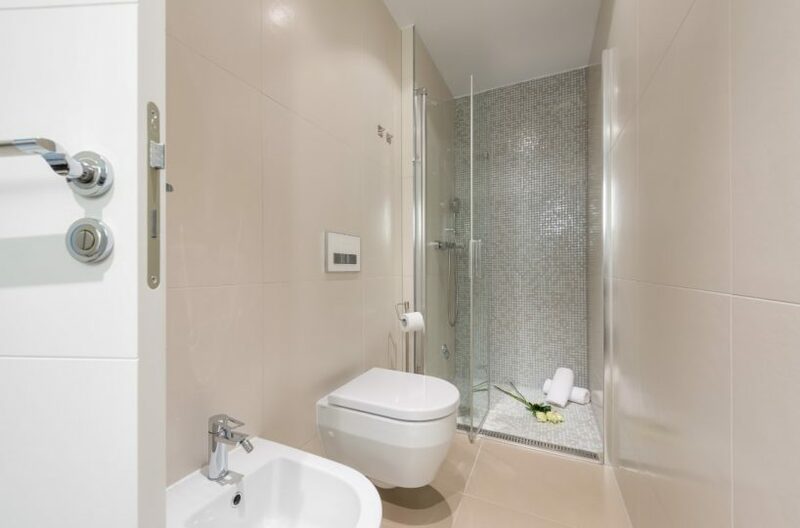 One double bedroom with en suite bathroom and sea view is set on the ground floor, as well as an additional guest toilet. First floor of the villa features three double bedrooms with en suite bathrooms and a master bedroom with its own bathroom and a wardrobe. All the bedrooms are air-conditioned, equipped with LCD TV and offer magnificent sea view. 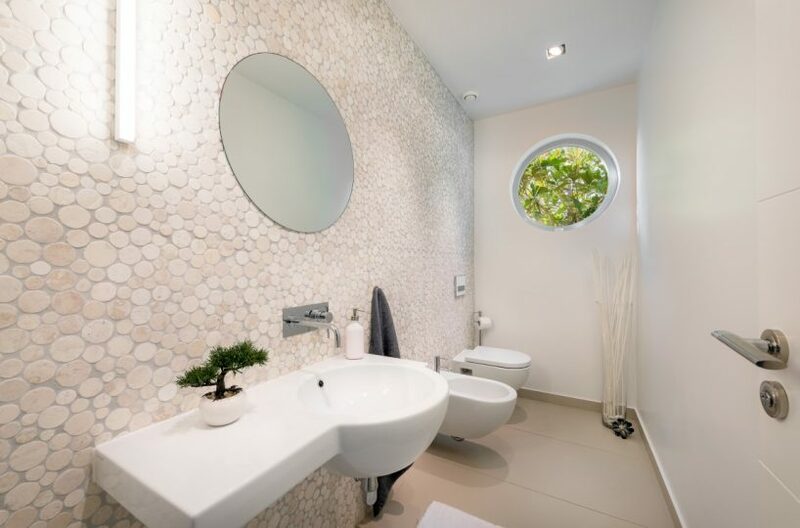 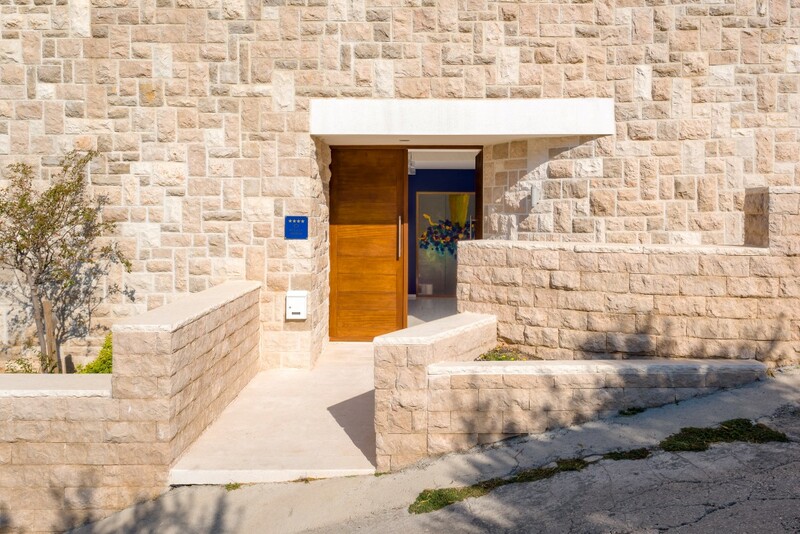 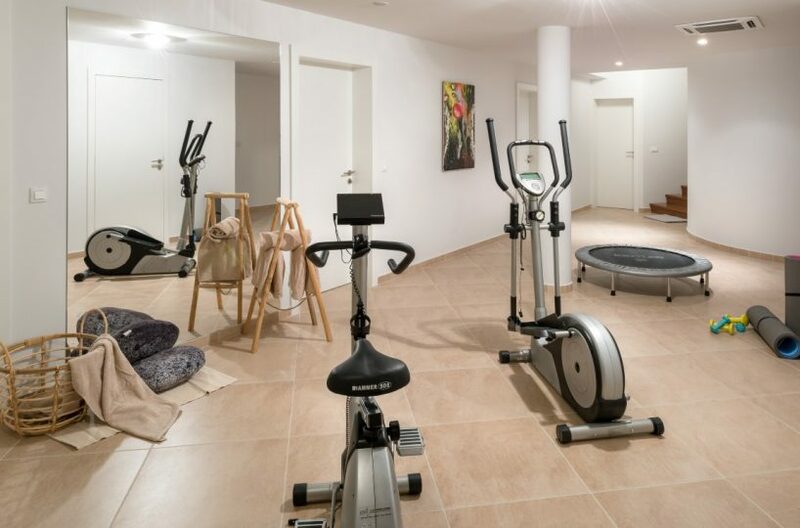 Basement of Villa Dalmatia Luxury features gym, bathroom, laundry room with washing machine and ironing facilities. 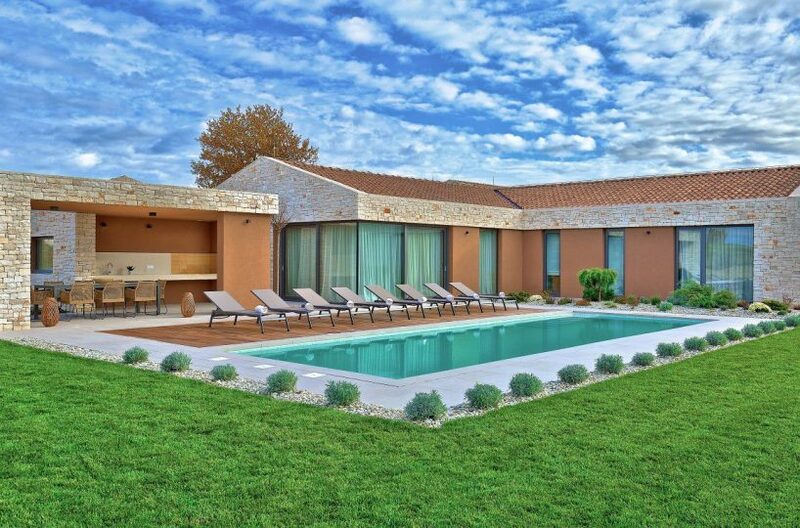 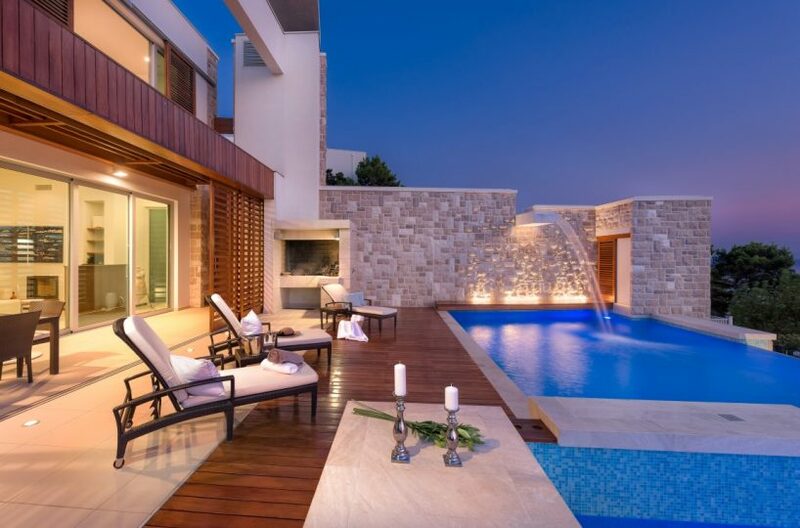 Special feature of the villa is a heated infinity swimming pool with 2 meters depth and massage set. 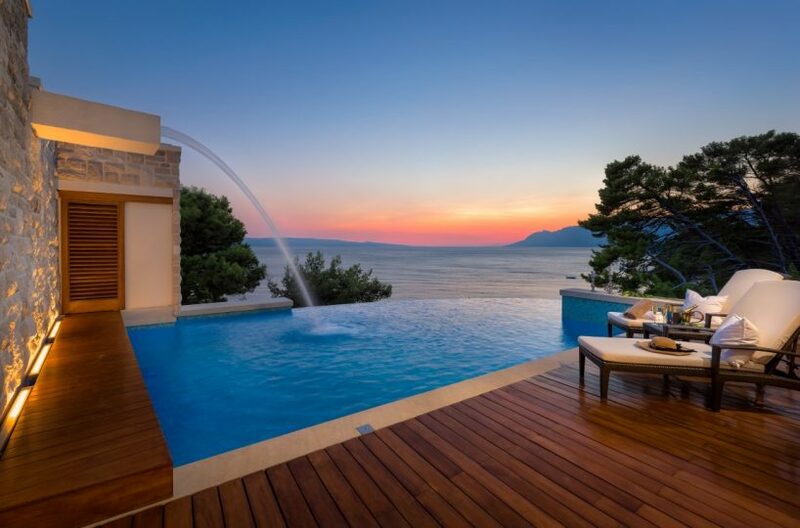 Next to the pool, there is an additional toilet on the terrace. 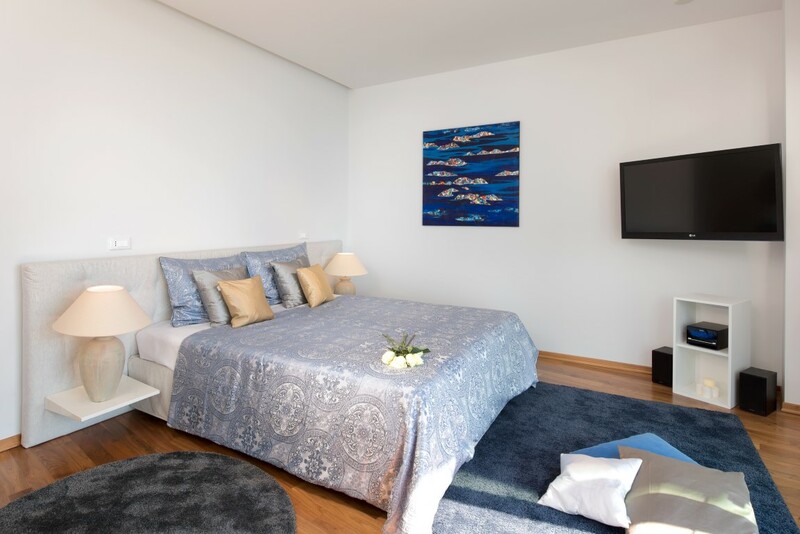 Parking with 4 places is available for the villa’s guests, as well as Wi-Fi throughout the property and air-condition in all the rooms. 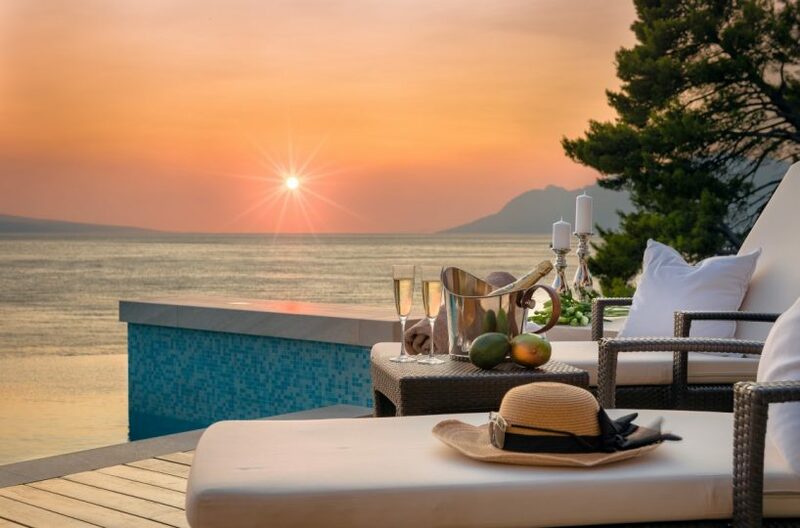 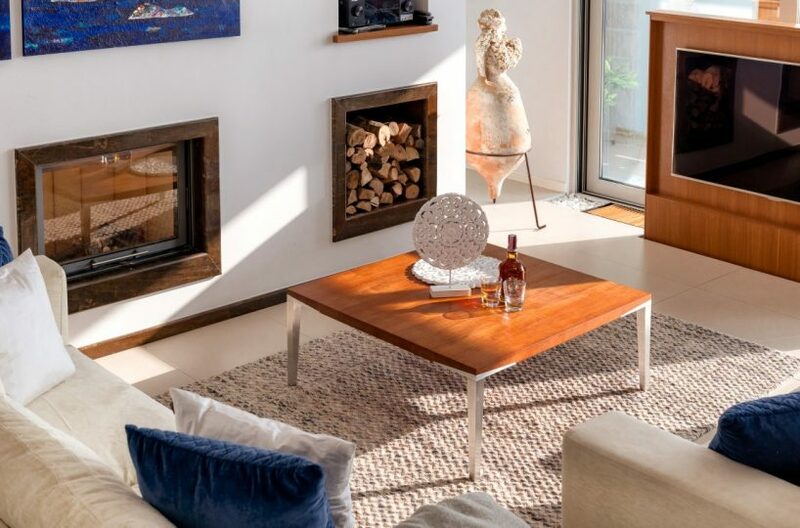 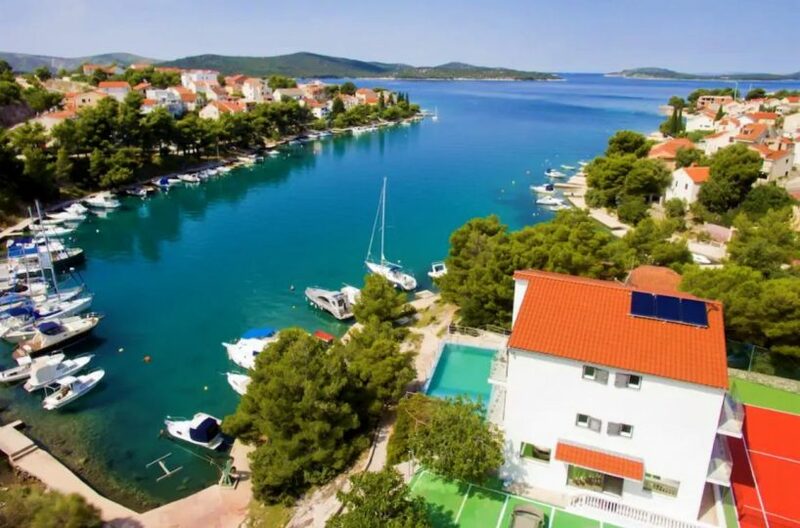 If you desire a luxurious Mediterranean experience in a villa surrounded by nothing but the natural beauty, choose Villa Dalmatia Luxury and you will experience an unforgettable vacation in Croatia.